Many Facebook campaigns go live on Fridays. However, the day that generates most user engagement for a campaign on the social network is the Tuesday, which ranked only fourth in terms of the number campaigns conducted. These are some of the findings of a recent study done by Yesmail Interactive. The results are based on a three-month study of consumer engagement with online campaigns for 20 major retails brands, including Abercrombie & Fitch, Gap, or Ralph Lauren among others. The study with the title “Using Digital Market Intelligence to Drive Multi–Channel Success” figured out the customer engagement of campaigns on the most popular social networks. In order to understand campaign engagement, it compared the relationship between “volume-based engagement” of Facebook campaigns (number of “likes” or comments a campaign generates) and “actual engagement analysis”. The finding is quite obvious, in that the lower the brand “likes”, the fewer likes and comments a brand on Facebook gets. Still, independent of the size of their fan base, some retail brands generate higher engagement levels than others through Facebook. Nevertheless, average-performing brands still performed as engagement winners, including i.e. Ann Taylor, Eddie Bauer or Kenneth Cole. Although, we have already reported that a balanced frequency in posting status updates is important for the success of a Facebook campaign, there is no blueprint and guarantee for success. 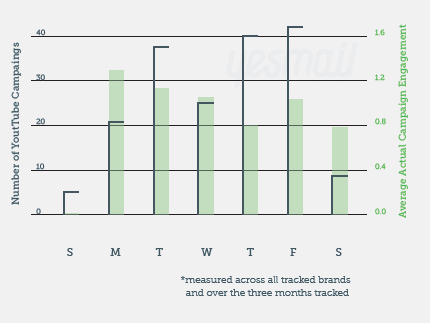 The most engaging brands had deployed between 20 and 32 campaigns per month. Compared to the five least engaging brands with 54 campaigns per month, it becomes obvious that posting less frequently is better. 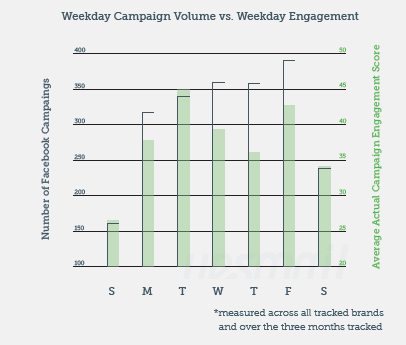 From a timing perspective, the best Facebook engagement was generated for campaigns launching between 10 pm and 12 am Eastern time (EST) which was also the least-used deployment time slot. For Twitter, the research showed that most Twitter campaigns (20%) were conducted on Friday, which again is the least engaging day for such campaigns. 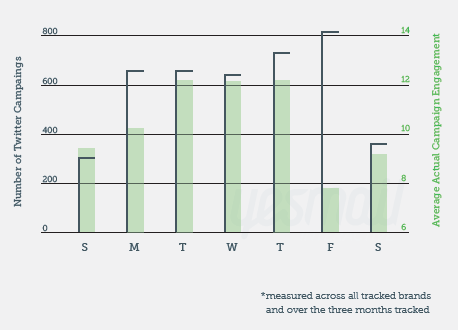 Almost on the same engagement level performed Tuesday, Wednesday, and Thursday as those most engaging campaign days. Over 84% of all Twitter campaigns were deployed within regular work hours (between 9am and 7pm EST). 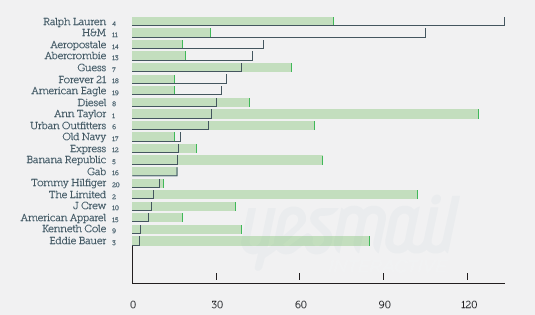 The performance of the 20 retail brands on Twitter showed big differences. Although Forever 21 came in first in terms of follower base, the brand’s campaigns showed significantly lower engagement among followers than the campaigns of brands with smaller follower bases. The five most engaging brands did 45 to 70 Twitter campaigns per month on Twitter versus the five least engaging brands with an average number between 95 and 115 Twitter campaigns per month. It shows again that lower frequency is better than big blast promotions. If marketers want to generate high engagement, they should place their campaigns between 5 am to 6 am and 7 am to 8 am EST. In terms of YouTube campaigns, the study found that 85% of the brands studied have a YouTube channel. Still, just 35% deployed campaigns during the research period. Some more findings indicate that on average, retailers conducted 3.5 campaigns per month during the study. The best day for interaction occurred to be Monday. Do we have to mention that this was the least likely day for campaign deployment? YouTube campaigns deployed between 2 am-3 am EST found the highest engagement rates. The study is based on campaigns conducted from January to March, 2012 via Yesmail Market Intelligence. The selection of brands focusses on 18-35 year-olds as of their digital communication interest.